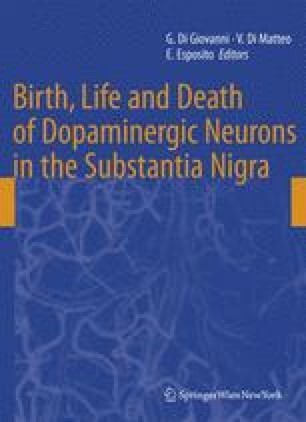 There is extensive evidence that oxidative damage of dopamine (DA)-containing neurons in the substantia nigra pars compacta (SNc) may contribute to the pathogenesis of Parkinson’s disease (PD). We evaluated the potential neuroprotective effect of diets enriched with wild-type Red Setter (RS) tomato or transgenic High Carotene (HC) tomato, rich in β-carotene, obtained by the activation of lycopene β-cyclase (tlcy-b), in an animal model of PD. Male Fischer 344 rats were fed for 14 days with standard AltrominMT diet, 5% RS- or 5% HC-enriched diet. Seven days after the beginning of this diet regimen, the rats were lesioned by 6-hydroxydopamine (6-OHDA) injected into the left SNc. After further 7 days, the rats were sacrificed, and DA and 3,4-dihydroxyphenylacetic acid (DOPAC) levels in both the left (ipsilateral) and the right (contralateral) striata were measured. Striatal DA levels were reduced by 86.5 ± 5.0% in control, 86.2 ± 5.0% in HC-, and 56.0 ± 9.0% in RS-fed group. Striatal DOPAC was decreased by 85.6 ± 5.0% in controls, 83.0 ± 6.0% in HC-, and 58.9 ± 10.0% in RS-fed group. Blood was obtained from the rats on day 14 and the plasma level of licopene and β-carotene was measured by liquid chromatography-atmospheric pressure chemical ionization-mass spectrometry (LC-APCI-MS) for the determination of lycopene and β-carotene levels. The plasma level of lycopene was 4.7 ± 0.2 ng/ml in 5% RS-fed rats, while it was undetectable (< 2.5 ng ml−1) in control and HC-fed rats. The efficacy of RS diet to preserve striatal dopaminergic innervation can be attributed to the ability of lycopene to prevent the degeneration of DA-containing neurons in the SNc. This study has been carried out in the frame of a MIUR L.297/96-financed project (SAFE) to Agrobios Metapontum. We thank Dr. Francesco Cellini and Dr. Angelo Petrozza, Agrobios Metapontum for kindly supplying RS and HC tomatoes and Dr. Gianluigi Forloni, Mario Negri Institute for Pharmacological Research, for the helpful discussion.